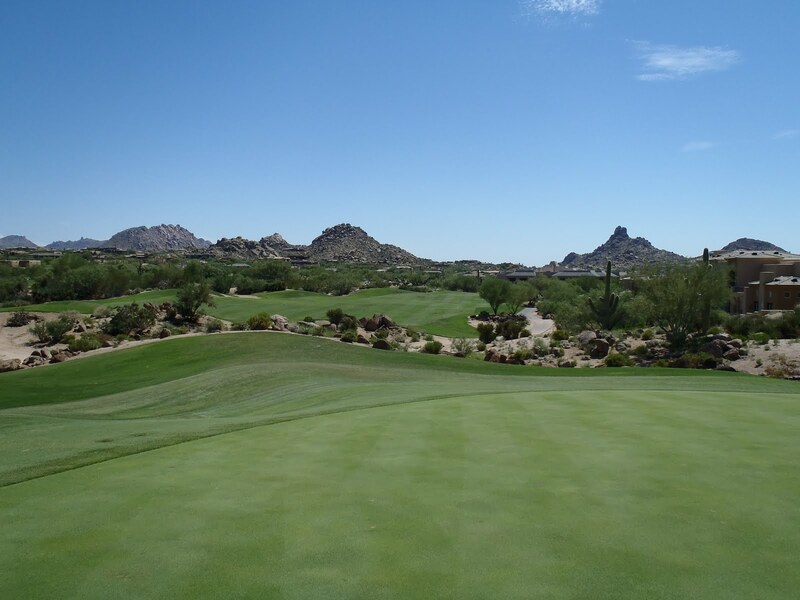 Troon North Golf Club’s Pinnacle Course in Scottsdale, AZ sits at #21 on Golf Digest’s 2010 Top Courses You Can Play list. Honestly, I would rank the Monument Course higher, as some other publications did, but picking between Monument and Pinnacle is like choosing between Guinness and Stella Artois; regardless of the choice you won’t regret it. I was much happier with my game this time around. I took full advantage of the information given to me and made a plan for each hole on the tee. I started looking at the widest parts of the fairway and meatiest sections of the green. I asked the smarter questions. Where can I miss? Should I hit a 7-iron and risk it short into a trap or a 6-iron and maybe hit it flush into the back rough? It was hard to tone it down when my partner was bombing drives 35 yards ahead, but as evidenced by me taking 7 of the first 9 holes in match play, it was worth it. Sure Sean struggled to a 104 that barely registered lower than the temperature, but coming out down 1 to start the day and winning 6&5 was pretty satisfying regardless. As was the fact I only had 3 penalty strokes compared with 12 the day before, and one was because I really did not want to be pricked by any more cactus. Once again the course was in excellent condition. The practice range was closed as is their protocol for Mondays so I focused more on putting pre-round. As far as the course goes, there are few around that afford as much pleasant scenery as the Pinnacle Course. The entire layout sprawls throughout the area and after teeing off the first hole you won’t be near the clubhouse again until the 18th. Along the way you get great views of Pinnacle Peak and the surrounding mountains, views that stretch for miles along the valley (from one tee box you could see the giant space ship that the Arizona Cardinals play in, University of Phoenix Stadium way out in Glendale) and houses out of an episode of MTV Cribs. The course was a little more crowded today as we played through one foursome and heard another cussing through a couple holes, but once again it felt as if it was just us on the fairways 90% of the time. The highlights of this course were the par 3’s. Each were beautifully designed and fun to play. Though I bogeyed all four of them, they were all just misplayed up-and-downs, once again proving I am awful at putting. They each required a different club and all had different characteristics when planning out your game plan. The 6th, the longest, played into some wind at a large green that had a nasty false front. #8 was a short iron but into a narrow, deep green that sloped back to front the entire hole. The 170-yd 13th played the easiest but with three sand traps around the green was no picnic. And #16 was flat out the most beautiful hole in the Troon North Golf Club, more on that later. In the end my trip to Arizona was a very memorable one, as they always are. The golf was truly inspiring and has motivated me to keep plugging along to all 50 states. I wish I could play a lot more, but there’s this job that I have to show up to occasionally. 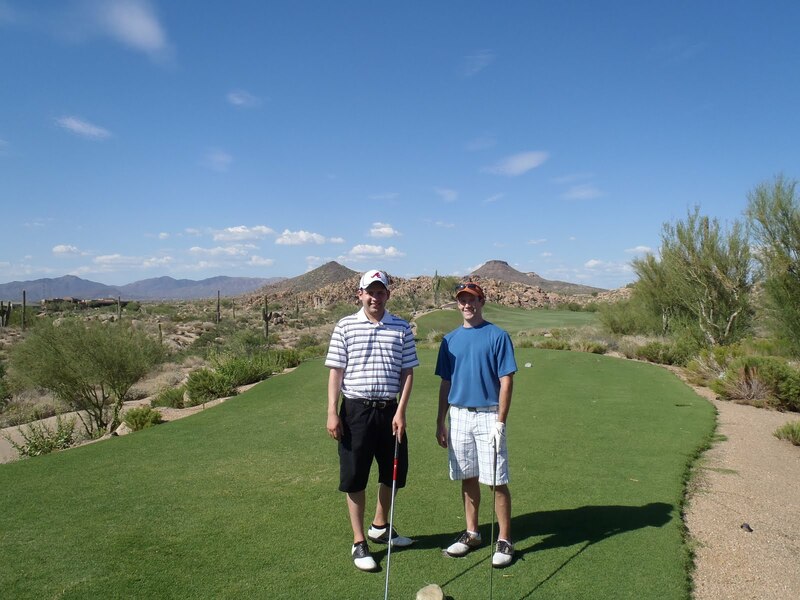 Stepping onto each tee was exciting watching shot after shot soar into the flawless blue skies of Arizona was an experience I can’t recommend enough. That and beating Sean by 16 strokes and winning a 36-hole match 6&5 of course. It’s no secret why this hole was named “Post Card”. The view from the tee box to the green is just as beautiful as from green to tee box. 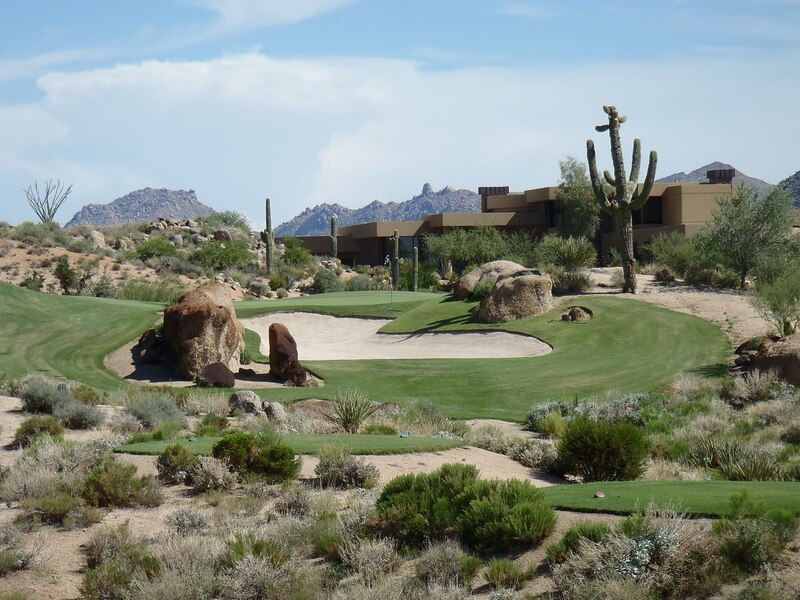 With stunning homes, eye-pleasing curves and a nice lake all carved into the desert landscape, all I really have to do is see the pictures below and know why I loved this hole. I played a 3/4 gap wedge that landed just short of the forward pin position, nearly holed the chip and then two-putted (oops). If only I’d played a maybe an 80% wedge that thing would’ve been in the hole. Amenities: 5; the practice range was closed, but I remember it being very nice. 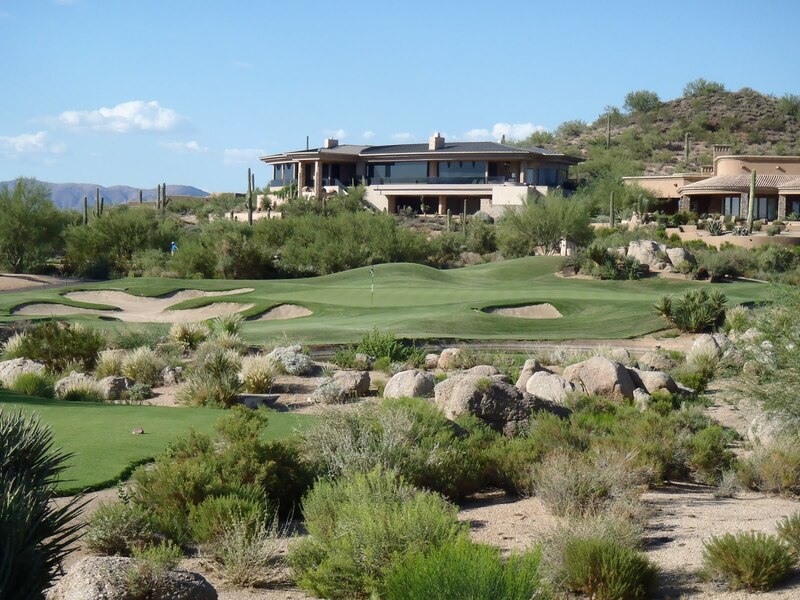 Difficulty: 4; the desert waits on both sides of the fairway, subtle breaks on the green make reading them tough and well-placed hazards are abundant. 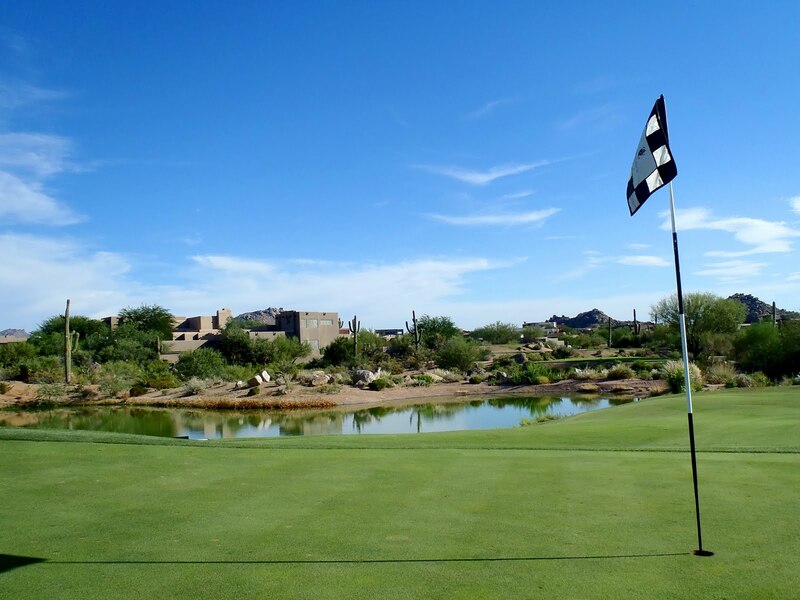 Scenery: 5; gorgeous holes and beautiful homes, with quiet along the entire course. Heaven once again. Overall: 4.75; what else to say but I love this course like Eric Cartman loves Cheesy Poofs.